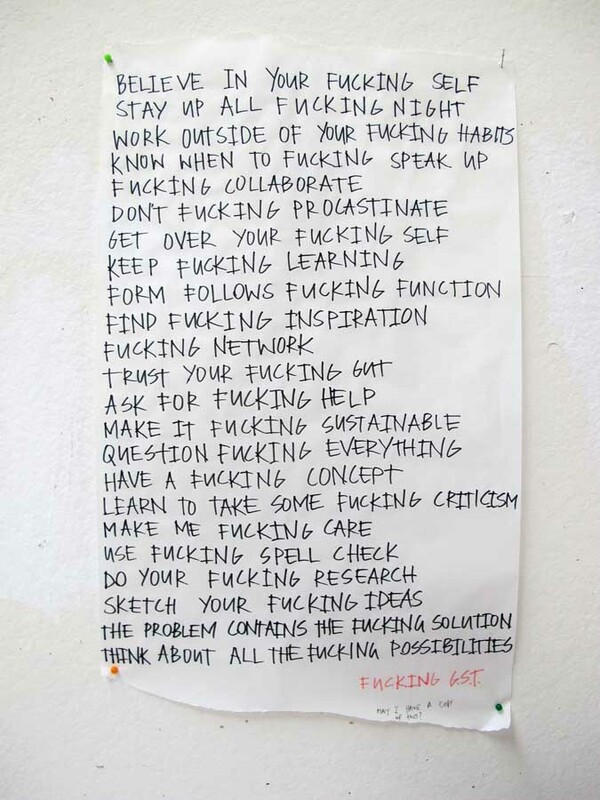 Photo taken in Australia of a ‘proclamation’ pinned up in the studio of a nameless architecture school by a nameless student, sent to us by a well known architect who prefer to remain nameless. We don’t approve of swearing but felt there was something here, on balance, that was worth posting. 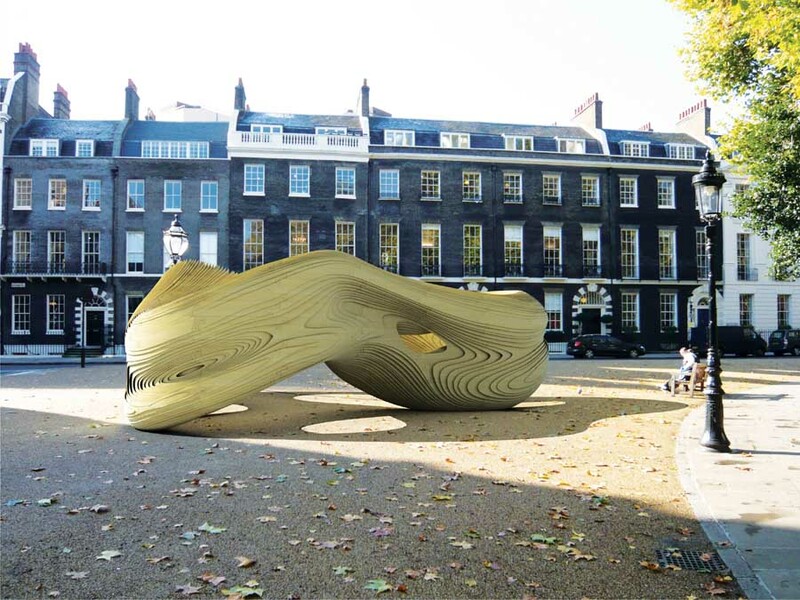 ARCHAOS – a UK student body – is to be replaced by the Architecture Students Network. Archaos is a student architecture society that was founded in 1999 by the two student representatives on RIBA Council who felt students should more actively communicate with the RIBA. Membership of archaos is automatic and free for all UK architecture students. Archaos is for and organised by architecture students. The success of Archaos depends on the opinions of students and encourages communication and the expression of ideas. Membership of archaos is automatic and free to all UK architecture students. The two current RIBA Council student representatives chair archaos and act as mediators between the students, professional bodies and the press. archaos aims to be as transparent and accountable as possible, with an open agenda reflecting the current mood in Schools of Architecture. The society has direct links to students in every UK School of Architecture and so is able to encourage discussion and experiment with any initiatives. archaos web site allows UK architecture students to have a voice at a professional level through the RIBA Council and the press. archaos chairs architecture conferences acting as think-tanks for student policy and agenda. All architectural practices are obliged to offer their Part 1 and 2 employees certain minimum conditions of employment which comply with UK legislation and the EU Working Directive. The archaos website describes the work conducted in association with the RIBA, recommending levels of pay and ensuring all UK architecture students get a formal contract of employment. Whether a year-out architecture student or a post-part 2 you should have a formal contract with your employer, the contract should state the name and address of the architect, start date of employment, period of employment, level of remuneration, number of hours per week, overtime payment conditions and sick pay entitlement. All UK architecture students on their Part 1 and 2 Placements are allocated a Practical Studies Advisor who is responsible for ensuring the student is getting the proper experience. There are anomalies between UK architectural education as translated by Universities, different architecture schools put emphasis on different parts of the curriculum. Archaos want to help school leavers decide on which University School of Architecture would best compliment their skills and interests, and to help Part 1 architecture students who have completed their Degree decide whether to stay at the same school of architecture for Diploma or move to another School of Architecture. There are currently 36 RIBA validated UK Schools of architecture and a further 58 Schools worldwide. There are also new architecture courses in the UK which have a conditional status. archaos is compiling statements from UK architecture student representatives about their Schools of Architecture. The Colin Stansfield Smith Report ‘Architecture in the 21st Century’ (1999) was commissioned by the RIBA as a review of architectural education which sets out ideas for the future of UK architecture education. The RIBA have updated and rewritten the outline syllabus for UK architectural education. This affects all UK architecture students and came into effect from September 2002. The title of archaos’ Edinburgh conference and indeed many of its concerns, immediately recalled another ‘Education of an Architect’, Cooper Union’s esoteric publication on what it is to learn. Located somewhere between a state of ‘mystery’ and ‘confusion’, with its own apparent architectural foundation, archaos is, upon consideration, an ideal term for the ‘national student architectural society’. The name might at first seem divisive, but readily surrenders all that is arcane and chaotic about it, when its etymological foundations are seen to hide in an abyss, or formless void. The archaos society seemed primarily concerned with the comprehensive gap that exists between university and professional practice in its third forum that took place on Friday 2nd February at the Edinburgh College of Art. The forum heard how the RIBA was looking to increase student involvement both politically and educationally. The audience learnt that under the Future Studies initiative, students who choose to research cutting edge issues concerning the environment or future methods of communication and technological progress (through a dissertation, for example) now face the prospect of financial support and incentives, in addition to more general encouragement. In concluding, the archaos representatives asked fellow students to write in to them and give details of the nature and politic of their courses, so that a database could be provided on the web, which might better inform other applicants of their own suitability to each particular education on offer. They asked for students currently seeking employment or on the verge of so doing to contact them, so that their progress might be monitored, and better advice might be made available and changes implemented or suggested. The archaos proposed programme for the day began with a brace of introductions and concluded boldly, though embracing exclamatory irony, with ‘The answer!’. As a result of an extended ‘outline syllabus review’ discussion towards the end of event – the ‘opportunity for all to give feedback and assess the day’ was deferred to ‘licensed premises’. It is clear from the enthusiasm of the students to continue any such debate outwith the initial forum that the issues touched upon during the day’s proceedings are highly contentious. From the scattering of discontented seeds at the outset – students not being paid a decent wage on their ‘year out’ (if paid at all); schools and practices showing little reciprocity of responsibility for the students’ well-being; students previously not figuring in any of the bodies that compiled reports pertaining to their predicament / situation – to the scattering of hopeful rays at the close of the forum – archaos were approachable, had funding, had connections – a number of issues were prevalent. Professional Studies Advisor (PSA) Judi Farren-Bradley briefed the audience on the trend over the last fifty years for architects to receive their education primarily at university, where once they would have been apprenticed. Drawing on Gropius’ analogy of the Bauhaus’ workshop laboratories, she mentioned how architecture had made a transition into a ‘white heat technology’ research field in the 1960s. University was envisioned as being as much a site for architectural experimentation and investigation as it already was for chemical or biological exploration. She described the education of an architect as being a seven-year period and made no distinction between academic and professional practice. (Taking this holistic view, it seems perplexing that education should be seen to conclude after seven years and not continue until retirement). She posed several questions in considering the triangular relationship between student, PSA and practice ‘mentor’: Where should the responsibility lie (for finding work / providing certain skills)? What measures should be taken if one party – e.g. the PSA – does not exhibit sufficient intervention / interest? (The current structure of the professional studies handbook allows for the PSA to indirectly voice a student’s concerns through their own authoritative voice). Who should pass the final qualifying warrant? The example of the surveyor student was mentioned: left to find work alone and un-monitored in their progress; however, it is their employers who validate the qualification not the university. On the subject of ‘The Real World’, Russell Brown from Hawkins Brown offered refreshment into the precarious realm of first job procurement. Students selected by his practice were chosen on merit of character and potential rather than a dry knowledge of technological practices (CAD proficiency, as I read it). The key to being a successful job applicant, he advised, ability aside, was a social finesse. He warned present third years that the attainment of a quality placement post Part II, could be infringed or facilitated by a careless or imaginative choice of Part I position. Speaking second, Bill Black of Richard Murphy Architects echoed this caveat, urging students caught in the chasm (between Parts I and II) to “put pressure on yourselves to do well”. Such a call for pressure seems superficially redundant given the number of students who complained about a depression in dedication to work in third year arising from the stresses of planning job placements simultaneously; however, it is perhaps useful for the student to acknowledge that the pressure comes from within and not, more helplessly, from a breakdown in bureaucratic responsibility. For the purpose of the day, point 2 was considered under the separate headings ‘design’ and ‘technology’. Each of the focus groups delivered a ‘mini-presentation’ in turn, engendering open discussion subsequent to each speech. Whilst it was noted that, in Britain, architects fight for the right to protect their title, the protection of their function was far less revered: architects allegedly construct only 20% of buildings. Of this fraction, the forum wondered how many were fully responsible for (and in) their actions? Afternoon Chair John Lyall was adamant of the role of architectural design assessment procedure and tutors to act as a screen to the suitability of students to ascend to the ‘title’ rank of architect: ‘Bad students have to fail for the good of architecture’ was his harsh-but-fair conclusion with the remaining good students accordingly gifted ‘the best we can offer’. An empathetic Lyall placed his hand on his heart to the revelation that what worried students most was their lack of technological & constructional knowledge: ‘It was the same when I was at college’ he concurred. Current tutor practice to perpetuate the myth that detail was an issue that should be left to the professionals, that it was almost at odds with creativity, was scorned. Lyall wondered why schools and institutions did not involve alumni or local practising architects more readily in the process of educating students constructively. He mentioned how he would be more than happy to show groups of budding architects around his current site projects. A student of an architectural-engineering course recounted how on a recent site visit she had been urged to ‘feel the detail’. This she found a comprehensive and beneficial exercise. CAD was discussed with suspicion: often it led students to design at home, away from the socially-constructive environment of the studio, ensconced from the realm of peer criticism; it was also questioned as a design development tool, with the reservation that it discouraged rapid and varied exploration of ideas. The point was also raised that as a visualisation tool in the hands of unscrupulous architects, it had a seductive function far beyond the qualities of the actual scheme. Clients could become ‘conned’ by technology, rather than convinced by the design. On the issue of the professional / academic intersection it was argued that the two did not overlap as much they should. To remove extra financial and logistical burden from the university, practices and representatives could be invited to make the student aware of the issues involved in their roles as early in their education as possible, whether it be in teaching the young pretenders the importance of negotiating skills or in letting them experience the physicality of a building site. At one point in the proceedings, passing mention was made of the fact that there is, perhaps, a surfeit of qualified architects. A fall in numbers would surely make finding work as a Part I more straightforward, whilst reduced numbers should lead to greater standards of education and the production of architects with clearer ethics. If only the question was as direct. Edinburgh Contemporary Architecture collaborated with Lothian Careers Advice in organising a Day Event ‘Inside-Out’ for selected fifth-year school pupils interested in pursuing a career in architecture or construction. This ‘Architecture Education’ event took place in 2001 and 2002, beginning at the Fruitmarket Gallery and finishing in the two University Schools of Architecture, where first-year architecture students and tutors were involved.